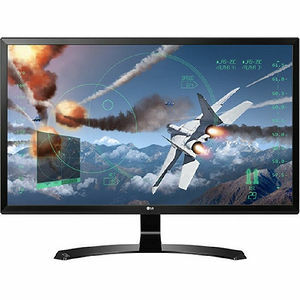 LG's Ultra HD 4K monitor based on IPS offers accurate picture quality without any distortion giving users a more realistic and immersive gaming experience. FreeSync offers high-end gaming to users without the screen tearing and stuttering that occurs due to the difference between the graphics cards frame rate and the monitors refresh rate. Black Stabilizer identifies the darkest areas and makes them brighter so that users can find enemies hiding in the shadows, with the assistance of Dynamic Action Sync which allows users to attack enemies faster with less lag time. The "Game Mode" including Custom (Game), FPS and RTS modes, enable users to customize their gaming experience by optimizing the settings of the game they choose. LG's Ultra HD IPS monitors offer users both a larger workspace and accurate and detailed expression, providing an enhanced visual experience. Users can easily customize monitor settings, with just a few clicks of a mouse. Screen Split divides the display for different tasks by resizing the windows on the screen. With PIP Mode you can work while watching a video in a window floating on the screen. With up to 14 options available offering an efficient and professional working environment. The coexistence of smoothness and solidness in the curved structure. The beauty of ArcLine is the icing on the cake.